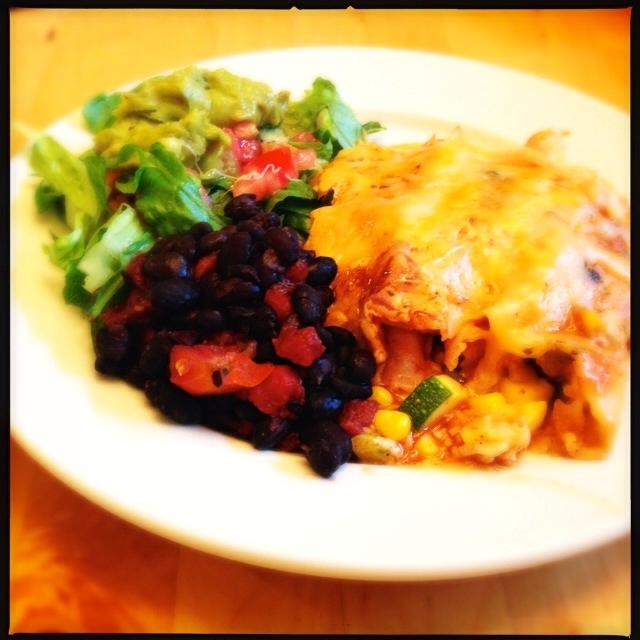 Here’s our master recipe for enchiladas. 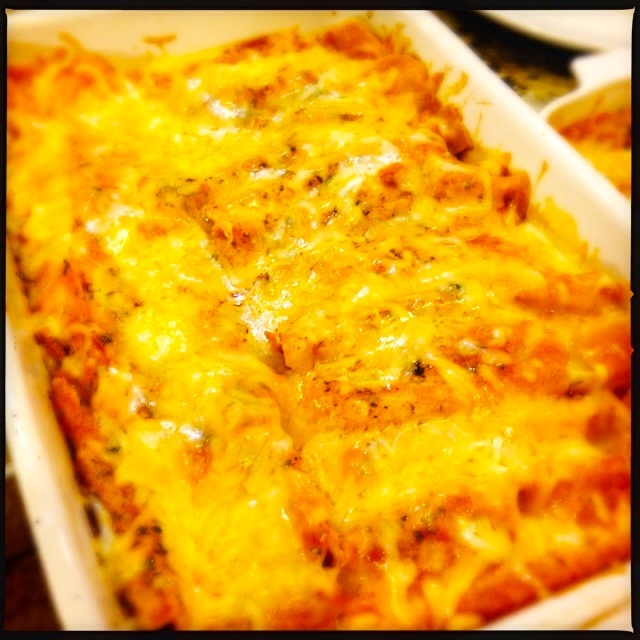 We call this one “Weeknight” Enchiladas because it is a quick and easy recipe (see the end for the recipe! ), and if you do the chopping ahead of time it can be rolled and heated up during a busy work week (or even reheated if made ahead). Best of all, kids really love to help make these, and definitely love to eat them! The plates came back cleaned. Here’s how to do this. It boils down to a two-part process: chop up the vegetables, then roll them in tortillas and top them with enchilada sauce. You bake them until hot and top them with shredded cheese towards the end. Simple. You can make this even more simple by chopping your vegetables a day ahead. They will keep just fine for a day or two (uncooked). We had a bunch of chopped vegetables left over even after making a couple dozen enchiladas, so we decided to save them for making tortilla soup later this week. Chop your vegetables. This takes about 15 minutes. 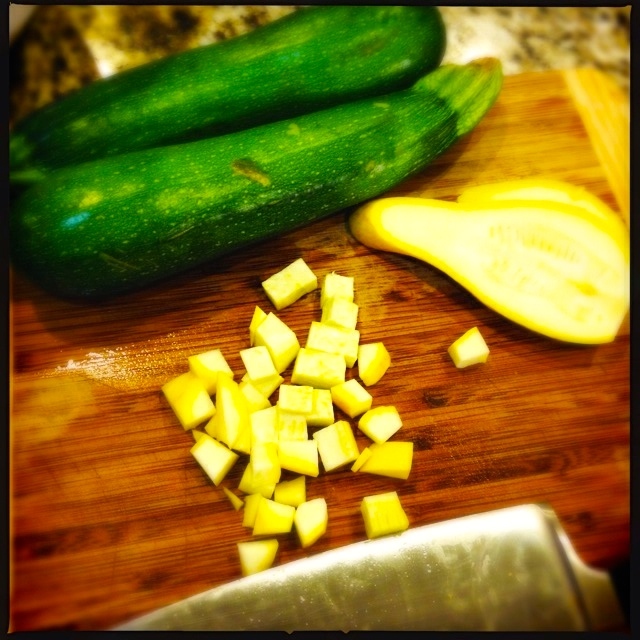 This time we used zucchini, summer squash, corn, sweet peppers and onions. I like to cut them into a small to medium dice (1/4 to 1/2 inch dice) and don’t cook them beforehand, because we like the crunch and body in the final enchiladas. 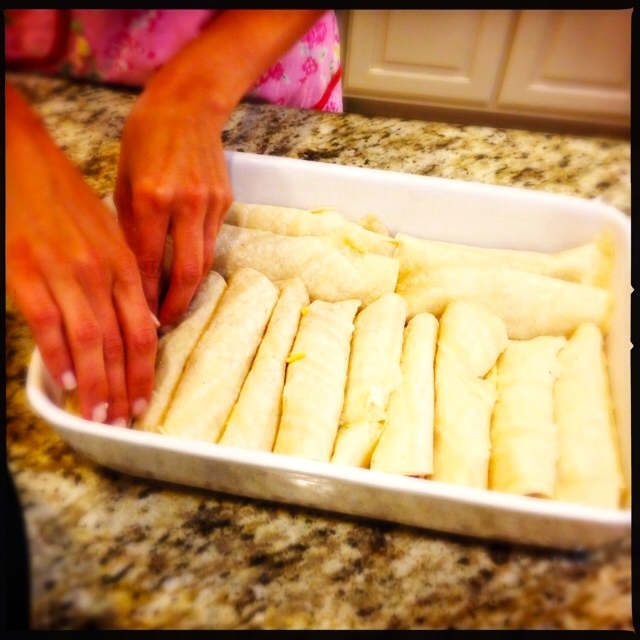 If you cut them smaller, or if you sauté them in a pan, they will become more soft in the final enchiladas. That can be great too, so just do it the way you like it. If you do sauté the vegetables, do that in a large pan with about a tablespoon of oil over medium to medium high heat for about 5 minutes. You don’t want them to become limp, just “no longer crunchy.” Feel free to taste them as they cook. That will teach you how far to take them. Add a can of green chiles, and a finely diced seeded jalapeño. When you chop the jalapeño, it is a bit of the luck of the draw on heat. If it is a hot jalapeño, be sure to remove the seeds and the white lining of the pepper. That helps control the heat. 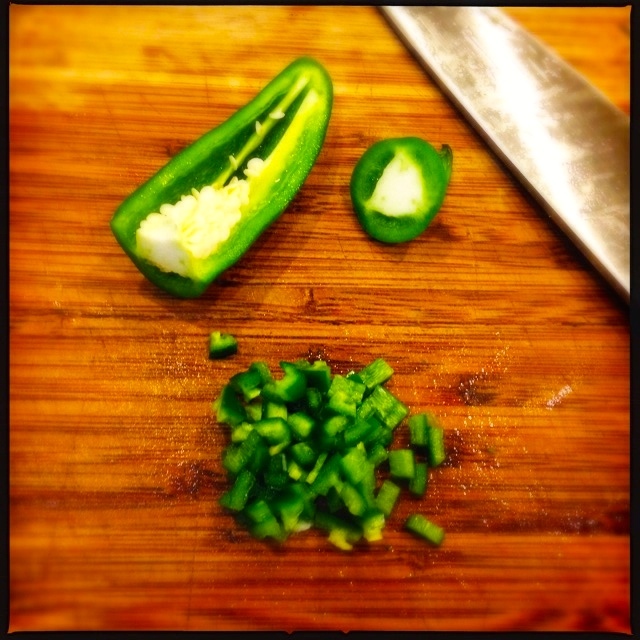 (So does cooking the jalapeño…) However, if you like it hot, use the whole pepper and don’t sauté it. Add a couple of tablespoons of your favorite Mexican seasoning (I really like Arizona Dreaming by Penzeys Spices), or if you have none, add a tablespoon of cumin, a teaspoon of oregano and a teaspoon of chili powder, and salt and pepper (about a teaspoon of each is fine). 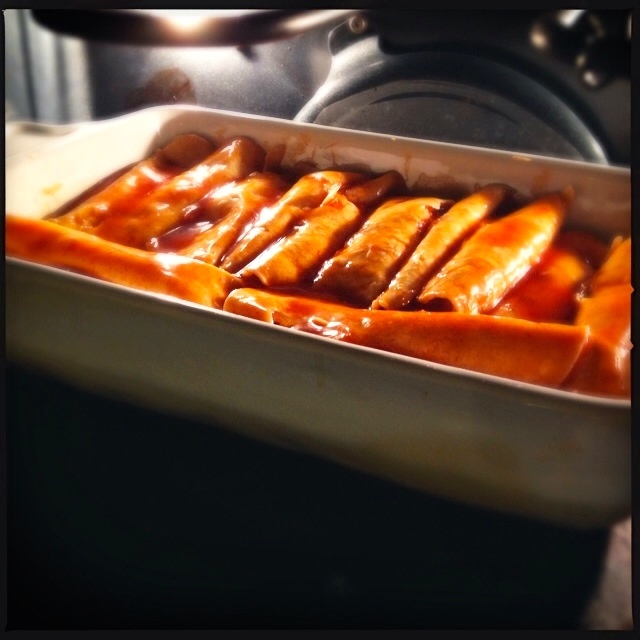 Sneak pic of the final enchiladas! If you are preparing ahead, this is the time to bag up the chopped vegetables and put them into the refrigerator. Chopped vegetables really don’t freeze well. The cold freezes the liquid in the cell walls and ruptures them. Once you break the cell walls, the structure of the vegetable fails, so when they are reheated, they turn mushy. So, don’t freeze them. If you have extras, make tortilla soup tomorrow. If you are using raw meat, prepare it while you are chopping your vegetables. For chicken breasts or parts, boil them until done in a pot of water with some bay leaves, salt and pepper. Let them cool and then shred them. For steak, marinate and then grill your skirt steak until done to your liking. When cool, slice or chop into thin pieces. (Thick pieces will be to hard to eat well once heated in the enchiladas.) For pork barbecue, smoke as usual and shred. I usually do this when I have leftover smoked pork shoulder. The basic rule with cooking the meat is to cook it until done. If you are concerned about overcooking the meat, add more enchilada sauce to the pan before cooking, or, if you are very careful, you can cook the meat until about 3/4 done and then chop it for the enchilada preparation. In that case, you will want to cook the final enchiladas until they are at least 165 degrees internally, tested with a good thermometer. (Frankly, its just easier to cook the meat through, then shred or slice or chop it, and not add in any food temperature uncertainty. If you’ve ever had it, you know that food poisoning is no joke.) 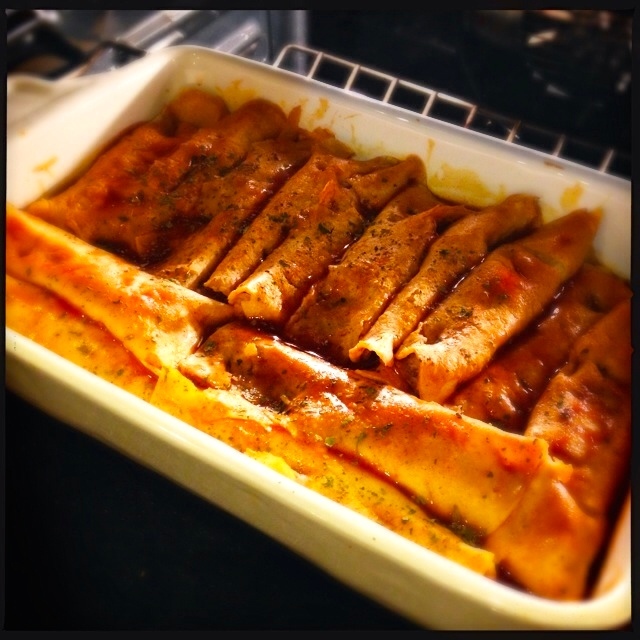 Store the cooled cooked meat covered in your refrigerator until you are ready to wrap the enchiladas. Now that it is day two (or you are ready to make and serve the enchiladas), take out your prepared vegetables and meat if you are using it. Preheat your oven to 350 degrees. Add about ¾ cup of shredded Mexican cheese to the vegetables. 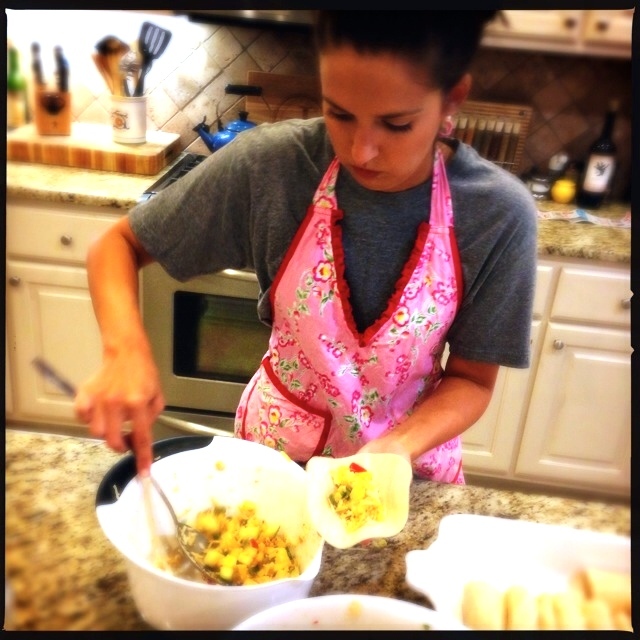 (We like the Mexican cheese that is a mix of a few cheeses, but comes without any added seasonings.) Add 1/4 cup of chopped cilantro (you can use more or less depending upon your preference). With a tortilla in one hand, spoon a one inch wide serving of vegetables across the middle length of the tortilla almost to the ends. Top with meat, if you are using it. …then the other side over that to create a tube. Place the seam side down in a baking pan. We use a 9 x 13 pan to start, and then put any overflow enchiladas into a smaller pan. This rolling process takes about 15 minutes. Once the baking pan is filled, add enchilada sauce. Like many things in life, this can be controversial. 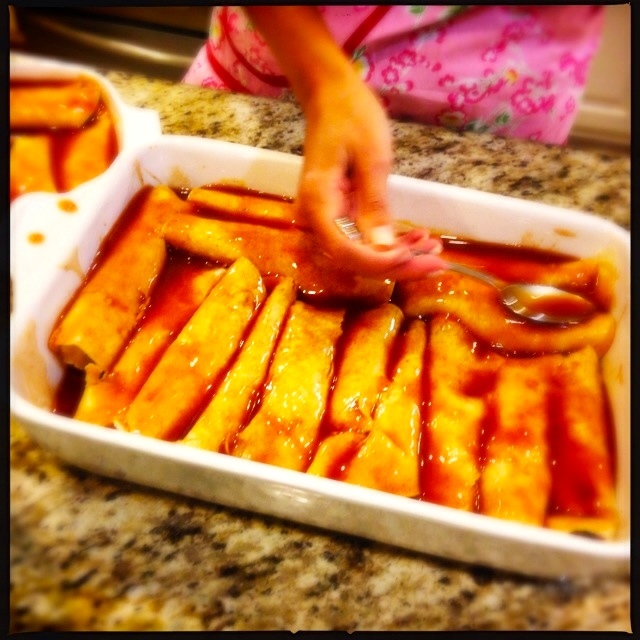 Some like to soak each tortilla in enchilada sauce before filling it. We just like to pour it in the pan about halfway up the enchiladas. Others like to fill the pan all the way up. If you add a lot of enchilada sauce, it makes it very wet. So that can mean the tortillas fall apart while they cook. That can be great or not great. In any event, you have been warned. Make sure that whatever amount of enchilada sauce you use, you spoon some over the top of each enchilada. That keeps them from going crispy on you. Bake at 350 degrees until hot—about 30 minutes or so. After about 25 minutes, they’ll look like this. Top them with your favorite shredded Mexican cheese. Touch them every so often to see how warm they are getting—we don’t like crunchy tortillas. (Careful, the cheese will be hot!) Pull them out when they are hot, but are still soft. Top these with sour cream and salsa, or any Mexican toppings you like. We served these with black beans and guacamole salad. A final note: you can certainly make and cook these fully a day ahead of serving and just reheat it. They get really soft that way, but they are so delicious that it really doesn’t matter. 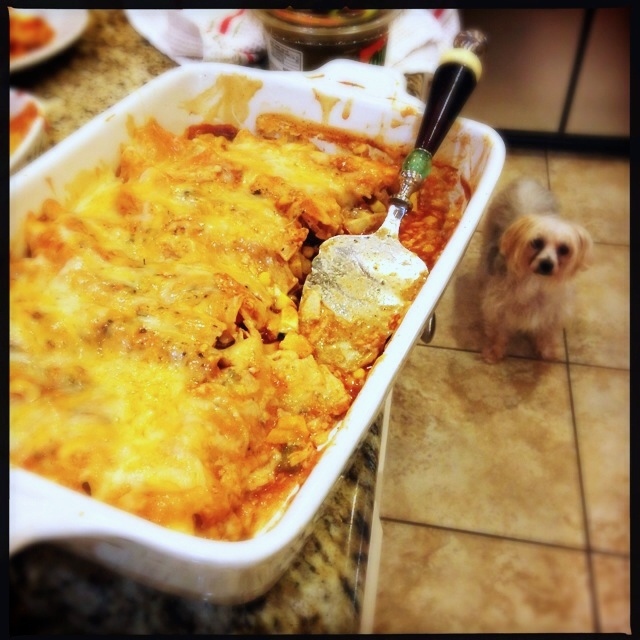 Here’s our master recipe for enchiladas. 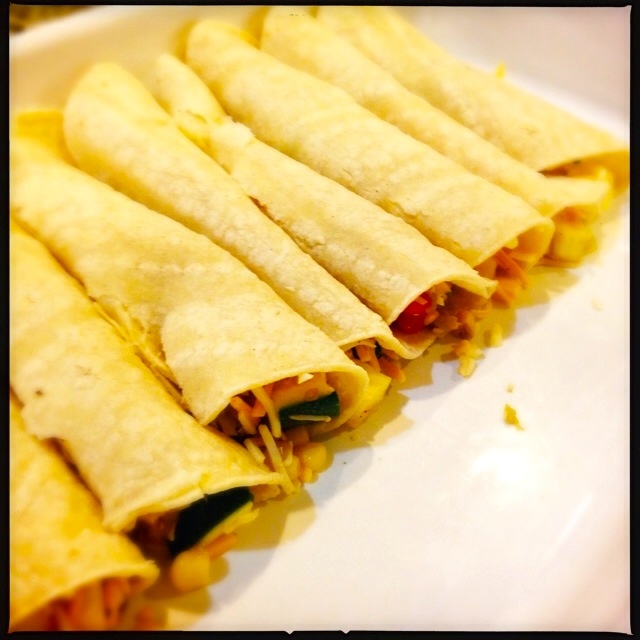 We call this one “Weeknight” Enchiladas because it is a quick and easy recipe, and if you do the chopping ahead of time it can be rolled and heated during a busy work week (or even reheated if made ahead). Best of all, kids really love to help make these, and definitely love to eat them! The plates came back cleaned. 2 T of your favorite Mexican spice mix (or 1 T cumin, 1 teaspoon oregano, 1 teaspoon chili powder, and 1 teaspoon each salt and pepper). Chop your vegetables. This takes about 15 minutes. 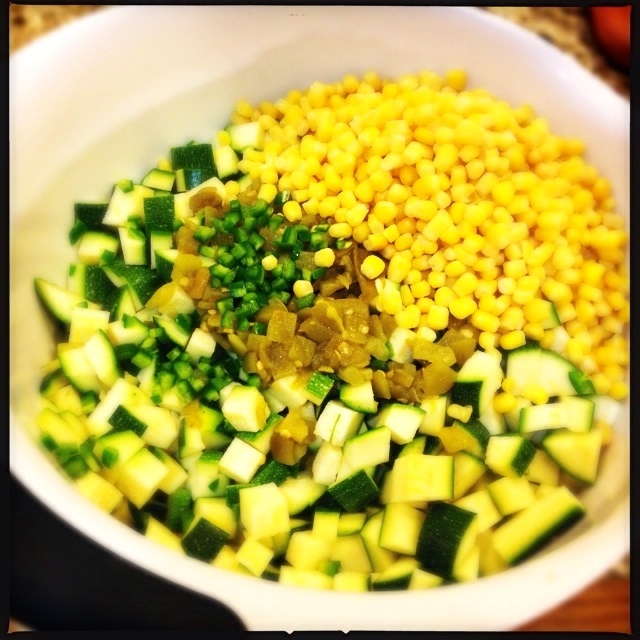 This time we used zucchini, summer squash, corn, sweet peppers and onions. I like to cut them into a small to medium dice (1/4 to ½ inch dice) and don’t cook them beforehand, because we like the crunch and body in the final enchiladas. If you cut them smaller, or if you sauté them in a pan, they will become more soft in the final enchiladas. That can be great too, so just do it the way you like it. If you do sauté the vegetables, do that in a large pan with about a tablespoon of oil over medium to medium high heat for about 5 minutes. You don’t want them to become limp, just “no longer crunchy.” Feel free to taste them as they cook. That will teach you how far to take them. Add a couple of tablespoons of your favorite Mexican seasoning, or if you have none, add a tablespoon of cumin, a teaspoon of oregano and a teaspoon of chili powder, and salt and pepper (about a teaspoon of each is fine). 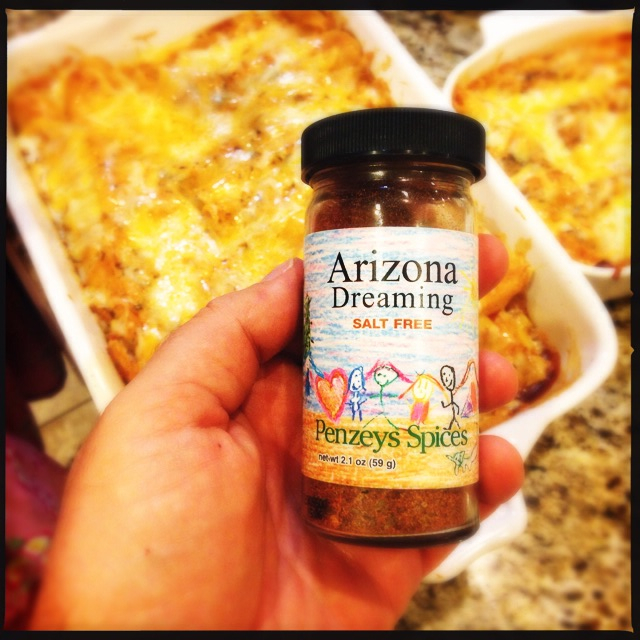 I really like Arizona Dreaming by Penzeys Spices. If you are preparing ahead, this is the time to bag up the chopped vegetables and put them into the refrigerator. Chopped vegetables really don’t freeze well. The cold freezes the liquid in the cell walls. Once you break the cell walls, the structure of the vegetable fails, so when they are reheated, they turn mushy. So, don’t freeze them. If you have extras, make tortilla soup tomorrow. If you are using raw meat, prepare it while you are chopping the vegetables. For chicken breasts or parts, boil them until done in a pot of water with 2 bay leaves, salt and pepper. Let them cool and then shred them. For steak, marinate and then grill your skirt steak until done to your liking. When cool, slice or chop into thin pieces. Thick pieces will be to hard to eat well once heated in the enchiladas. For pork barbecue, smoke as usual and shred. I usually do this when I have leftover smoked pork shoulder. 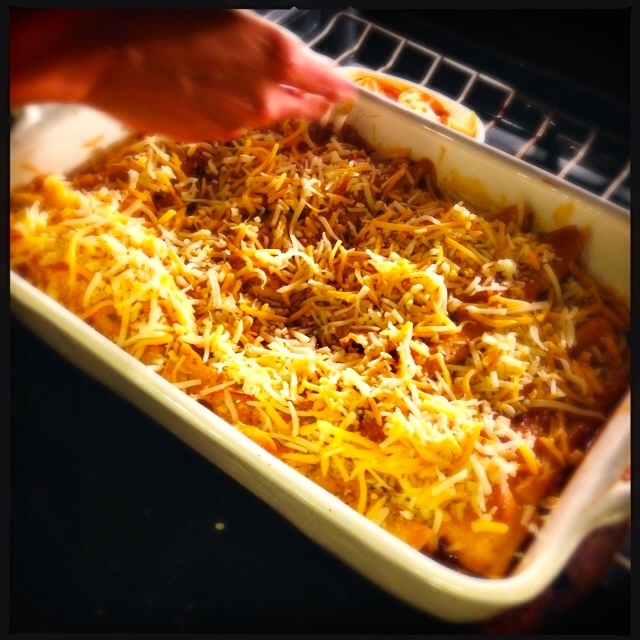 Store the cooled cooked meat covered in your refrigerator until you are ready to wrap the enchiladas. Add ¼ cup of chopped cilantro (you can use less or more per your own taste). With a tortilla in one hand, spoon a one inch wide serving of vegetables across the middle length of the tortilla almost to the ends. Top with meat, if you are using it. Then roll one side over the filling, then the other side over that to create a tube. Place the seam side down in a baking pan. We use a 9x13 pan to start, and then put any overflow enchiladas into a smaller pan. This rolling process takes about 15 minutes. Once the baking pan is filled, add enchilada sauce. We like it about halfway up the enchiladas. Others like it all the way up. Make sure that whatever amount of enchilada sauce you use, you spoon some over the top of each enchilada. That keeps them from going crispy on you. Bake at 350 until hot—about 30 minutes or so. After about 25 minutes, top them with your favorite shredded cheese. 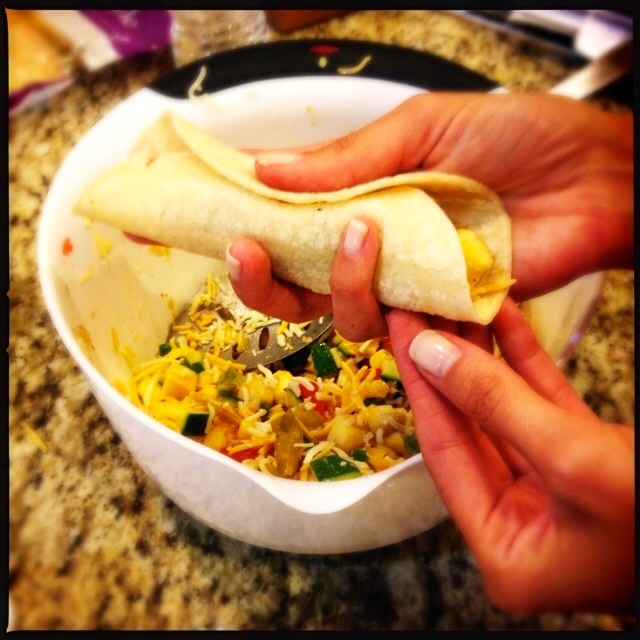 Touch them every so often to see how warm they are getting—we don’t like crunchy tortillas. Pull them out when they are hot, but are still soft. A second jalapeno sliced into discs, added with these cheese topping, gives great color and more heat for those who like to live a spicy life. What a GREAT idea, Richie! That will definitely amp up the heat! If you really want to get on the edge, you could use a mix of green and red jalapeños, or green jalapeños and red thai bird or other spicy red chilies! Color is such an important part of eating. I forgot to mention the addition of cilantro, and added that in above. Thanks for the reminder!! !